Typical, that I should be writing this as wind and sleet hammer at my window. Last week, Leicestershire played Cambridge MCCU under skies that matched the light blue of the students’ caps. Tomorrow, the season proper begins with a championship match against Glamorgan. Given that storms have been raging up and down the UK all day the chances of a punctual start are looking slim. I’d like to say that Leicestershire’s prospects this year are bright, but success in the FLT20 aside, last year’s results made for grim reading. Triumph at Edgbaston on Finals Day was a fantastic achievement, a testament to getting one over on the sleeping giants who underestimated them and then going all the way through a combination of never-say-die cricket and indomitable team spirit. It secured the county a place in the Champions League, and along with assistance from some generous benefactors, helped to drag the account books back into the black. A replication of that success this year is statistically unlikely, although, despite losing James Taylor, Paul Nixon, Harry Gurney, and Andrew McDonald, notable components of that victorious outfit are still with us: Abdul Razzaq will be back for the 6-week campaign, Will Jefferson (if fit) will play his heart out, and never underestimate a team that has Josh Cobb bowling while Matthew Boyce patrols the boundary. Becoming Twenty20 champions managed to take the sting out of finishing bottom of the Division 2 table of the County Championship. But to be brutally honest, I’d gladly forgo any future success in T20 for promotion to Division 1. That, to me, and most supporters of county cricket, is the trophy that matters most. I look at what we have lost in terms of personnel and it is discouraging. James Taylor is again in the news, having hit 101* for Nottinghamshire against Loughborough MCCU. 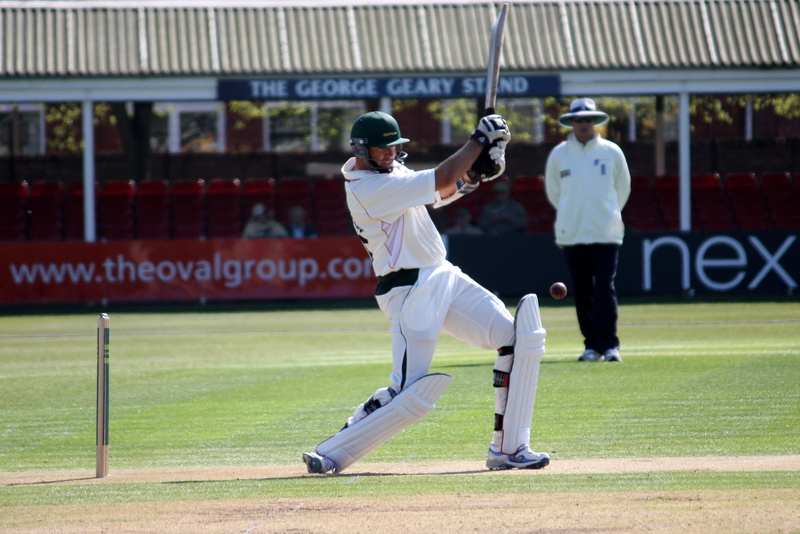 In comparison, Leicestershire were beaten in their encounter with Cambridge by 100 runs (granted, the stated intent was always to bat as if it were a four-day rather than a 50-over encounter, but the students seem not to have gotten that memo, accelerating markedly during their last 20 overs to set a total Leicestershire never looked in danger of chasing). 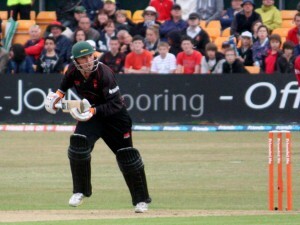 As a Leicestershire supporter, I’m proud of the success our players have gone on to enjoy. But that doesn’t help us win championships. I find myself with the same mixed emotions as this time last year: as the season starts, I see exciting young talent waiting to be developed and potential waiting to be fulfilled in the likes of Shiv Thakor, Rob Taylor, Greg Smith, and Ned Eckersley, and further Lions honours on the horizon for Nathan Buck, but I also see bigger clubs with bigger cheque-books hovering like vultures at the end of it. It seems no matter how many England players we produce, we remain that most unfashionable of counties, the one everyone wants to leave. James Taylor has cited as the main reason for his move to Nottinghamshire his desire to test himself against first division bowling. One cannot blame him for making a move that will further his career, but given his talent, that he should have left was always going to be on the cards. Harry Gurney, too, had good reasons for leaving, due to a lack of opportunity in the four day game. But the fact remains that we are currently mired at the bottom of a division that’s regarded by many as a ghetto of losers, has-beens and never-will-bes, and this is why promotion is so vital, if we are to stop losing our best players. Maybe it’s the weather, but I honestly did not set out to be so gloomy about Leicestershire’s chances this year. Aside from our promising young talents, Ben Smith, the county’s new batting coach, has arrived with a mission to transform Leicestershire’s batting in the four day game, and new signing Ramnaresh Sarwan, still feeling the sting of being dropped from the West Indies setup, is hungry for runs; hopefully the bad weather he’s experienced since he got here hasn’t dampened that zeal. This year is likely to be another rebuilding year for the Foxes. Tomorrow, when the game against Glamorgan is due to start, the forecast is for overcast conditions but thankfully no rain. Here’s hoping at points during the season we see the sun. As I write this, Leicestershire are en route to Hyderabad to take part in the Champions League T20 tournament. They booked their place in this series by dint of reaching the English domestic T20 final at Edgbaston back in August, which they of course went on to win. As the crowning achievement to a superb domestic T20 campaign it is a fitting reward, and all Leicestershire fans will wish them well ahead of their first match against Trinidad and Tobago on Tuesday. The financial rewards are, of course, very welcome, and so is the shiny FLT20 trophy residing in the display cabinet at Grace Road. But that the departure for India followed hard on the heels of yet another crashing defeat in the LV= County Championship serves as a reminder that as a season of contrasts the difference between Leicestershire’s T20 form and its performances in Championship and CB40 matches in 2011 could not have been more stark. 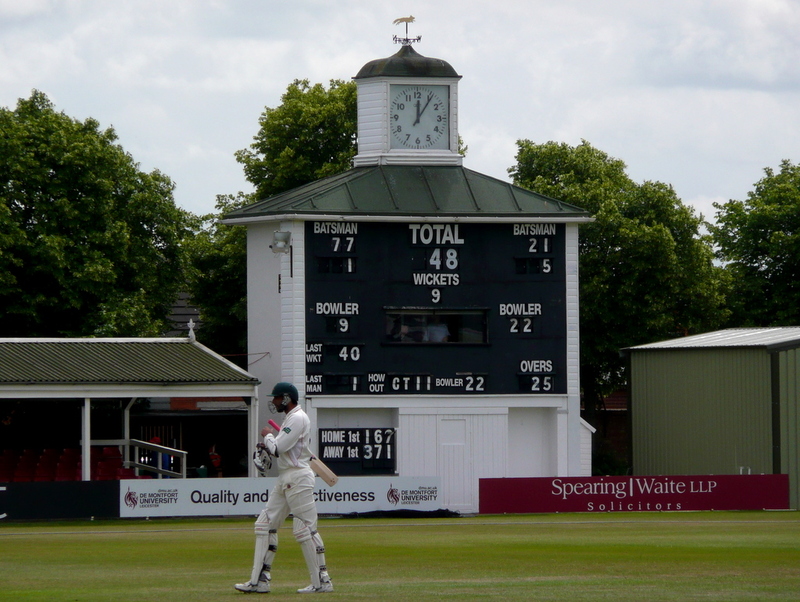 In the Championship, Leicestershire finished at the bottom of Division 2 by some considerable margin – compare their 88 points to the next team above them, Kent, who amassed 149. They won only one game, against Glamorgan at the start of the season. Among their defeats, scores of 34 all out against Essex at Southend, and 48 all out at Grace Road versus Northants, are but only two moments in a long litany of failure which Foxes fans will be keen to have scrubbed from the memory banks. The team are not incapable – with a couple of exceptions it is virtually the same lineup that won 7 matches last year, finished fourth in Division 2 and was in with a shout of promotion – but if anything their performance as a unit in the four-day game seems to have gone backwards. Over the last few days, the only part Leicestershire has played in the greater scheme of who ended up where in the table was as a potential spoiler to Middlesex eventually ending up as division champions. There were rays of hope for next season for the Foxes: first innings centuries for Greg Smith and Ned Eckersley (who also took six catches behind the stumps during the visitors’ first dig), and useful 50s for the two as well as a much needed 80 (from a personal as well as a team standpoint) for James Taylor in Leicestershire’s second innings as the Foxes strove for at least the moral victory of making Middlesex bat again. Wayne White put his back into the bowling to give Middlesex some palpitations on their way to a negligible target of 124, but as a win for the visitors was never in doubt, it was a case of sweeping up the shards of a team’s shattered respectability. Last year, I seem to recall, ended on a note of hope for the new season, too, so you’ll excuse me if I take a pass this time on the Michael Vaughan method of taking the “positives” out of the situation. 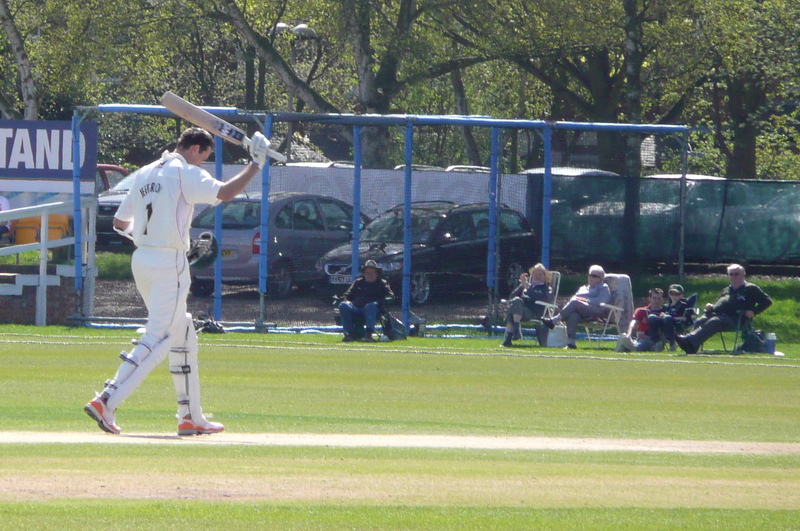 As with so many of Leicestershire’s championship endeavours in 2011, the bad more often outweighed the good – one instance in this match just gone being that Leicestershire’s extremely indifferent bowling in the last 30 overs of Middlesex’s first innings allowed the visitors to score an additional 182 runs after being 320-8. I realise I might sound curmudgeonly about all this, given the team are embarked on what will be, for many of them, one of the biggest adventures of their young lives, and with the promise of riches for the club at the end of it. Indeed, it’s easy to gloss over failures in other formats. T20 gets people through the turnstiles, money into the club’s coffers, entry into international tournaments and sponsorship and publicity. For a small, struggling club like Leicestershire, this is immense. Through the combination of numerous initiatives, cuts in expenditure and success in the T20, the club is in considerably better financial shape than it was last year. 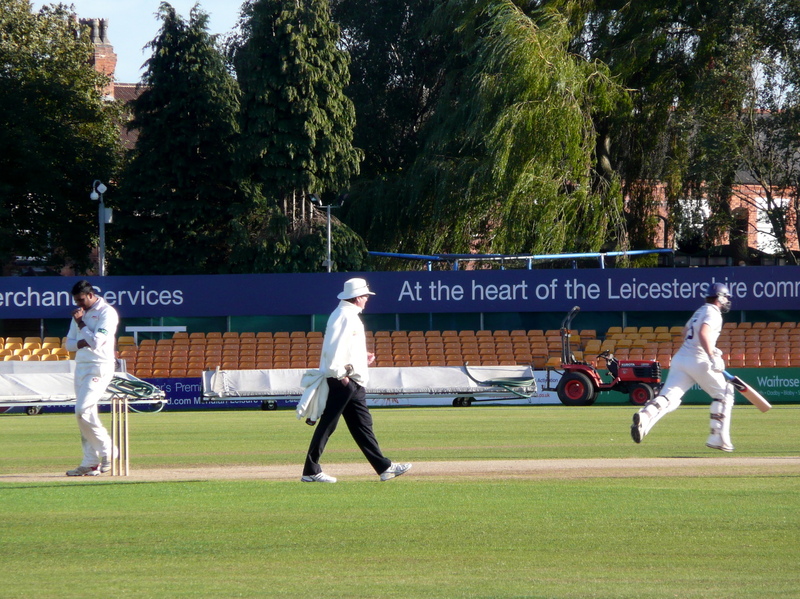 The 40-over competition is also popular with the fans – there have been some decent crowds at Grace Road for the CB40 matches – but despite this it is widely disregarded as the least important of the three domestic competitions, and Leicestershire very quickly gave the impression of not really caring about the format either, given the frequency with which players were rested. But continued under-performance in the four-day game can only hurt the club in the long run. Future England players are judged by their performances in this format. Warwickshire are likely to take a second tilt at prising James Taylor away from Grace Road over the winter, and given the clubs’ relative performances this year, one could hardly blame him for going. While the likes of Greg Smith and Ned Eckersley are talented but callow enough that rival clubs will wait a couple of years before brandishing their chequebooks, Leicestershire’s continued poor performance will not encourage these players to stay should a county with a Test ground come calling. Success in glitzy T20 tournaments is all very well, but the goal of promotion to Division 1 of the County Championship should take precedence over everything else. There is, of course, the feeling that Division 2 breeds reduced expectation – sure, there is the sop of a trophy for winning it, but the reward of promotion looks distinctly second-best compared to hoisting the trophy amidst the kind of scenes we saw at Taunton yesterday. The irony is, of course, that Lancashire ended up 2011 County champions with a team appreciably no better than Leicestershire’s in terms of “star quality” – but they triumphed through a combination of consistency, self-belief and unwavering determination to attain that one clear shining goal that they never lost sight of. 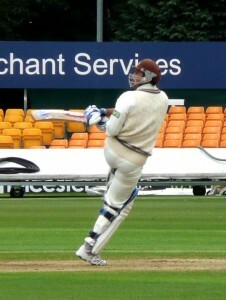 Leicestershire need to get themselves into a position where that goal can become a reality, and that means promotion. Hopefully the money that’s come as a result of their T20 success can be used in this direction. Andrew McDonald will not be with us next year. I’ll be very surprised if James Taylor hasn’t played his last championship game for the Foxes. There’s talk of finding a senior batsman to add some much needed experience and stability to the batting and to act as a mentor to the youngsters (HD Ackerman filled this role admirably a couple of years back when Cobb and Taylor were still wet behind the ears). Martin van Jaarsveld is one name that’s been bandied about, and Nic Pothas has recently become available after being released by Hampshire. Either of these would be very welcome additions indeed. I, like other Foxes fans, will be sitting on the edge of my seat over the next couple of weeks, cheering the team on in their Indian adventure, willing them on to another final and another trophy. One can be nothing but immensely proud of them for their success in T20 this year. But one would hope that once their plane touches down back in the UK, when they leave behind the heady atmosphere of a steamy subcontinent, the bright lights of the Indian stadiums and the crowds and the adrenaline, and return to a chilly, misty, leaf-strewn Grace Road, that their attention turns once more – and with some urgency – to next year’s County Championship. And that should include trying to figure out what went so catastrophically wrong in 2011, and what can be done to fix it. These were just some of the scathing comments overheard at Grace Road today as Leicestershire were bowled out for 48 on day 3 of their championship match against Northamptonshire, subsiding to abject defeat by an innings and 155 runs. The day started off cool and overcast with a stiff breeze. By about 11:30 I’d noticed there were tears streaming down my face, and while this was down to the cold wind blowing across the field it could just as well have been despair at the fact that once again, our year seems to be heading south in at least one of the current formats. Greg Smith fell at 11:19: three wickets down, 33 runs on the board. James Taylor followed a couple of minutes later: 33-4. At 11:57 Leicestershire were 40-9 and spectators started leaving. At 12:08, it was all over. Matthew Boyce was top scorer, with 12 – the only man to make it into double figures. It is not the lowest ever total for the county – that was achieved, if achieved is the right word, in 1912, when Leicestershire were all out versus Kent to the tune of 24. It is not a statistic that makes the reading of today’s scorecard any easier. That this should follow hard on the heels of the news that Warwickshire have approached the club with a view to buying James Taylor out of the last year of his contract at Grace Road does not seem coincidental. Taylor was uncharacteristically out of sorts in this game, departing for no score this morning and making only 8 in the first innings. Leicestershire have said they have rejected Warwickshire’s offer, and will renegotiate a contract extension with Taylor to keep him at Grace Road. Taylor was not included in either of the two England squads announced this morning, for the upcoming Twenty20 and ODIs versus Sri Lanka, despite many predicting he would be. In answer to the very reasonable objection that surely, he is now the finished article, England’s selectors have indicated they would like to see Taylor face more first class bowling. Warwickshire’s director of cricket is Ashley Giles, a part-time England selector. Bizarrely, as well as offering to buy Taylor out of his contract, Warwickshire have also offered Leicestershire one of their players in part exchange to sweeten the deal. I’m guessing this would not be Jonathan Trott or Ian Bell. While one must perforce give praise to Northants’ bowling attack for their clinical and comprehensive dismantling of the home side this morning, it’s surely not a stretch to think that the questions surrounding Taylor’s future, and thus that of the club, has unsettled what is a close-knit dressing room. They would not be human otherwise. And this is what gets me, as a Leicestershire fan: that feeling of being torn between pride that one of our own is worthy of such covetous attention, and despair at the disruption this will inevitably cause the club. God knows we have had enough of that and more the last few months. The sun came out from behind the clouds today as the last wicket fell. For Leicestershire, however, the outlook is once again distinctly gloomy. 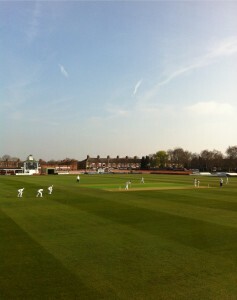 Being at Grace Road for the first day of the county season is a bit like coming home after a long journey. Your favourite armchair is in its usual place, your pipe and slippers are where you left them, the fixtures and fittings are timeworn but homely. In my case the journey took me to Melbourne and Sydney, to watch England retain the Ashes and win the series, a dream that took nebulous form four years ago and which, during countless days spent watching Leicestershire, gathered momentum to become reality, and with which I would console myself as the County failed to register another win. 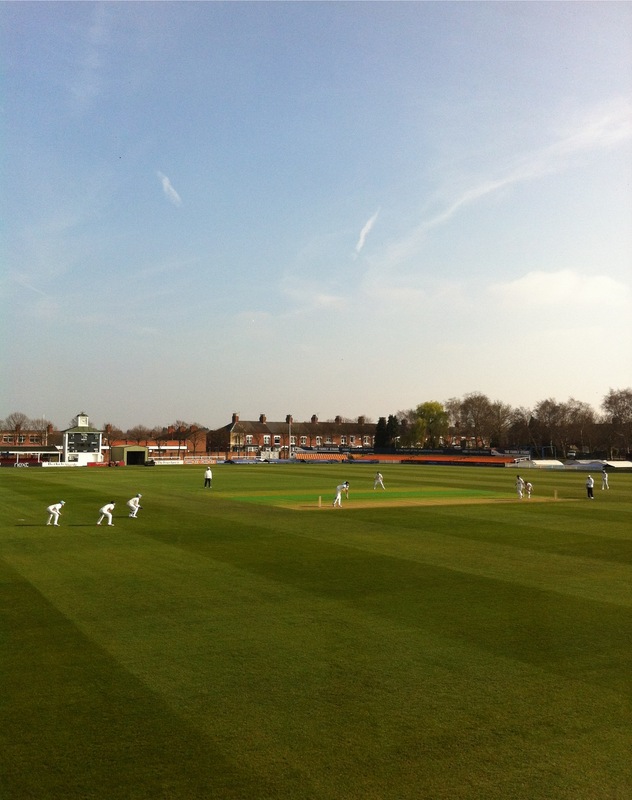 So returning to Grace Road after the winter just gone I felt like I’d come full circle. Very reassuring it was, too, that the troubles of last year are over, the weather was unseasonably glorious, and the team got their season off to a good start with a win over Glamorgan. Glamorgan have had their own off-field ructions, and there were on-field parallels between the two sides in this match as well, with a few superb individual performances but a distinct whiff of “first day back at school” syndrome about the batting. Dean Cosker ran riot with the ball on the first day and County were reduced to 147-7 at tea, but managed to drag themselves to a more respectable innings total of 238, thanks to a doughty innings from old stager Claude Henderson, with support from Nadeem Malik and Matthew Hoggard. Sixteen wickets fell on day 2, with Hoggard registering the first championship hat-trick at Grace Road since 1989. The cheering of Leicestershire’s supporters was tremendous – there was a decent crowd in for all four days – and batting hero Henderson played his part with the ball as well, chipping in with three wickets. Glamorgan’s prospects looked dead in the water when they were bowled out for 146; captain Alviro Petersen tried to lead by example in scoring 91, but the highest scorers after him were Ben Wright and Robert Croft, each with 11. Will Jefferson, all 6 foot 7 of him, was County’s standout in their second innings with 112, sharing a partnership of 149 for the 6th wicket with Jigar Naik. 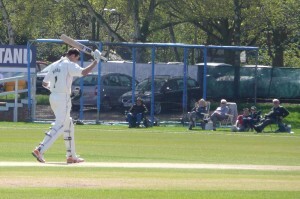 Glamorgan ended the third day three wickets down and chasing a total of 338. If the past few years have taught me anything, it’s never to take a Foxes win for granted, or to take any position other than a nice comfy seat on the fence in time-honoured Nick Knight fashion, or, even better, to find solace in my usual pessimism. 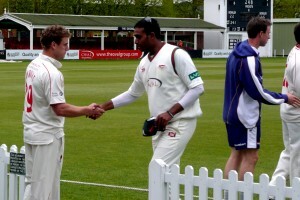 But win Leicestershire did, with Glamorgan falling short by 89 runs. It sounds a comfortable win, but the threat of rain after lunch was a potential spanner in the works and many pairs of eyes were raised worryingly to the heavens as the wind picked up and the clouds gathered. The immediate aftermath of a match is one of my favourite things about being at the cricket. There was the almost post-coital glow about the contented atmosphere in which spectators milled slowly around Lord’s after England’s victory in 2009, when Australia were beaten and Flintoff pushed his failing body to the limit, and beyond. There was Sydney 2011, when England, having already retained the Ashes, capped off their tour with a series win. There was much emotion in the stands on the part of the many England fans, but the post-match presentation was itself almost perfunctory since Australia were not the victors, and besides, I had a date with a dead man. After Leicestershire’s win over Glamorgan on Monday I took my time leaving, joining with the rest of the County’s supporters in clapping the lads as they came off the field (Jigar Naik in particular was the recipient of much applause for his 5-36) and the mood among the fans was buoyant and hopeful for the rest of the season. A couple of years ago Leicestershire’s prospects were diabolical, and just recently the club has been to hell and back with boardroom bickering that threatened to tear it asunder. No doubt we will have our ups and downs, but right now the 2011 season is ripe with possibility. I left Grace Road at 3PM and walked home in the teeth of an icy wind and rain that fell in a brief but violent squall: more typical weather for April; weather that seemed to mock the very idea of an early summer. By the time I got home my face was numb. I didn’t care. 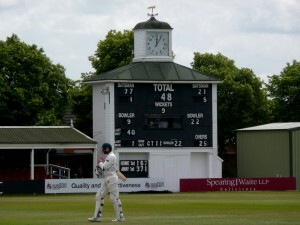 Leicestershire’s next encounter is at Derby on Thursday. Having been beaten into submission by the relentless 7-week slog of the just-finished World Cup, and with the IPL due to start up this year’s edition of the batshit commercial crack-fix that is T20, complete with cliche-spouting commentators, adverts after every over and uncoordinated cheerleaders (whatever happened to the ladies of the Washington Redskins? ), I am much relieved that Leicestershire’s County season starts tomorrow. County cricket might not be anything to write home about for many. It’s often difficult – especially given I support a struggling Division 2 side – to explain why it means so much to me. In fact to many heathens who ask me to explain why I love county cricket, most of the time I don’t even bother. 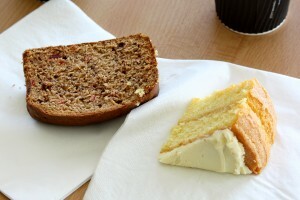 I know it’s not an ideal situation for a club’s finances – especially given that Leicestershire posted a record £400,000 loss last year – but sitting in a semi-deserted ground with a handful of other mentalists earnestly discussing the merits of watercress, the odds for the 3:30 at Kempton and the relative strengths of West Indies teams through the ages is my idea of nirvana. As Duncan Hamilton says in his wonderful book A Last English Summer, if people started turning up to county matches in large numbers I suspect I’d probably be like the moody teenager whose favourite cult band has sold out and hit the big time, and my enthusiasm would be dampened accordingly. I like finding a quiet spot to watch the game, listen to the conversations around me, chat with the regulars, or talk to no-one if I choose. I will either make a pig’s breakfast of my scorecard or leave out filling it in till I get home. I will follow the game with the attention of a laser beam, or sleep like an old dog in the sun. On any given day at Grace Road, I will do most of these things. Last year, most of the conversations at the ground revolved around one thing. Let’s just say the atmosphere was a little fraught. Thankfully, the civil war that was tearing the club apart is over. The last remnants of that conflict – legal action brought against the club by the departed Chairman and CEO – have recently been resolved. This year, I could do without the Sky News cameras rocking up and reporters on the boundary earnestly discussing the club’s imminent implosion. 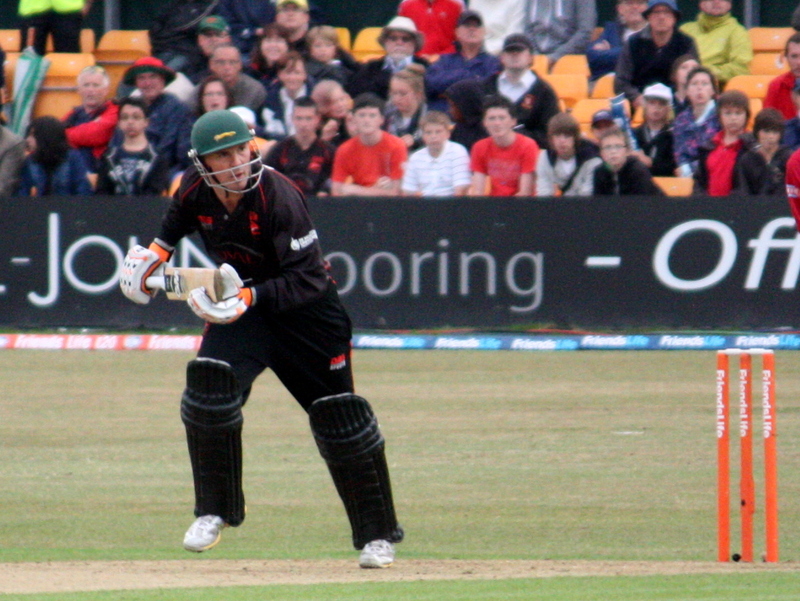 The good news is that, if anything, the squad seems to have been strengthened as a unit, and while there was definite room for improvement – Leicestershire did not register a single home win in T20 last year – the club battled right up to the wire in its tilt at promotion into Division 1 of the County Championship. Their attempt was unsuccessful – Leicestershire finished fourth in the Div 2 table – but it gave players and supporters alike much heart, something that was sorely needed at the end of a difficult year. 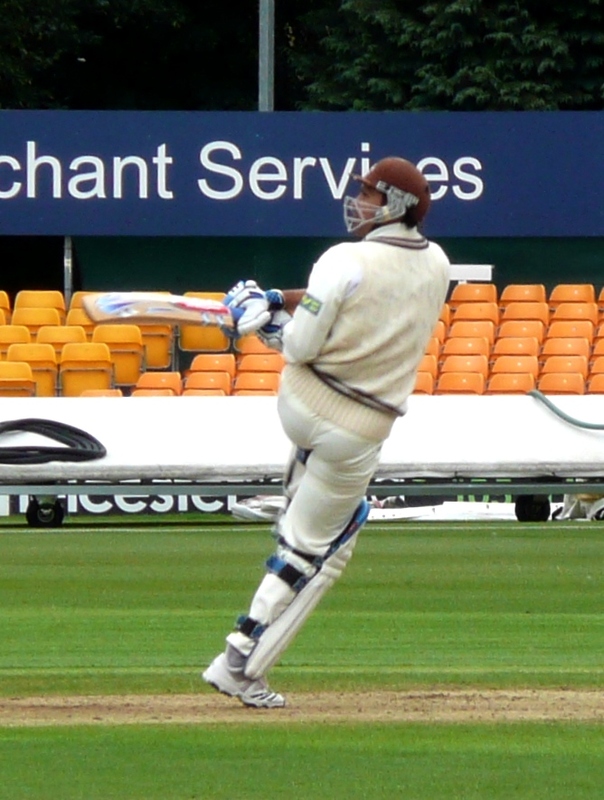 The curate’s egg that is the 40-over competition continues this year, and while there were some standout performances in 2010 – Harry Gurney’s 5-24 against Hampshire springs most readily to mind – the team’s results could at best be described as “inconsistent”, or underwhelming, if you were being brutally honest. We do still have our own little Little Master, James Taylor, at least until the end of 2012, when Notts et al will no doubt descend like vultures with chequebooks agape, luring him away to the bright lights of the Big Smoke and a Test ground. Taylor scored 524 runs for the England Lions during the winter campaign in the West Indies, averaging 58.55 and wowing the local commentators, none of whom could tell us anything we did not already know as regards the lad’s talent. Nathan Buck, our young star on the bowling front, was a fellow Lions campaigner and will have gained valuable experience with wickets taken on pitches not helpful to seamers. On the spin front, experienced campaigner Claude Henderson and his protégé Jigar Naik bowled well in tandem in the second half of the season and should prove useful again on the occasions Leicestershire play two spinners. Last year’s excellent overseas signing, Andrew McDonald, returns to Grace Road in May after his IPL stint with Delhi, and of course I would be remiss in not mentioning our redoubtable warhorse, Paul Nixon, who is coming back to fitness after knee surgery, and, last but not least, our captain, Matthew Hoggard, who in 2010 managed to keep his head while those in the boardroom were losing theirs. Once again the team is a balanced mix of young talent and seasoned veterans. This year, hopefully, they will have less off-field disruption to deal with. And hopefully fewer Sky News reporters for the wrong reasons. I might even be able to get some kip. Chief executive David Smith resigned because of chairman Neil Davidson’s meddling. Davidson managed to piss everyone off including the players, ground staff and yours truly. Two petitions were drawn up by members demanding Davidson’s removal, and Tim Boon said “time to blow this fucked up Popsicle stand” and buggered off to take up the England U-19 coaching job, and who could blame him. Now peace, of a sort, has broken out at Grace Road. Well, it’s more of a compromise, really. Neil Davidson has finally emerged from his Führerbunker and resigned. The special general meeting that was timetabled for November 17th has been cancelled after a meeting between the board of directors and the members who drew up the petitions. The AGM scheduled for March has now been brought forward to February, during which the current board of directors will resign and stand for re-election. In the meantime, Paul Haywood has taken on the role of chairman, and Mike Siddall is chief executive. Captain Matthew Hoggard has hailed these appointments as a positive step forward. The immediate effect of this is that a ceasefire has been reached and those who stood to be most affected by this – the players – are free to concentrate on their off-season training. Thankfully, the team seems to been brought together and made stronger as a result of this summer’s conflict. The opposite would have been utterly disastrous for the club, and let’s just say if, god forbid, that had come to pass, it would have been a case of pitchforks and flaming torches rather than a couple of petitions. But there are still unresolved issues. For a start, it was discovered the members do not have the power to remove the board of directors at a special general meeting, even if 75 per cent of the votes cast in the ballot call for it. Secondly, one of the other resolutions outlined in the petition was to hear from David Smith as to why he resigned. David Smith is still a member of Leicestershire County Cricket Club. Will we get a chance to hear his side of all that’s happened at February’s AGM? It would seem that once again, the board seem to have bought themselves some time, and we are still none the wiser. As a member, it would be nice to know precisely what these reasons were. Pretty much a large part of Leicestershire’s off-field summer has been comprised of bitching, backbiting, slanging matches, smokescreens, and now compromise. And we still don’t have the full picture. Will all become clear come February? I doubt it. Will anything change? That remains to be seen. Only god save us from another summer like the one just gone – off the field at least. Neil Davidson has announced his resignation as chairman of the board of Leicestershire CCC. Instead of going quietly, and with some measure of dignity, he has chosen to opt for a scorched earth policy and laid the blame for the club’s current crisis at the feet of captain Matthew Hoggard. Back in August, Hoggard and senior coach Tim Boon had sent letters to the board requesting Davidson’s removal, citing his interference in team selection. Coaching staff, the players, and the ground staff were known to be deeply unhappy. Tim Boon has subsequently left to become England U-19 coach. 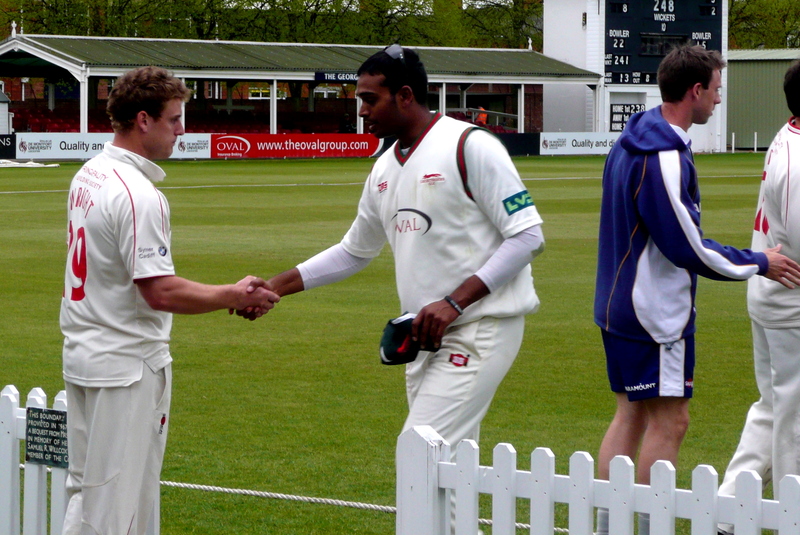 That was a pretty horrible week at Grace Road if you were a Leicestershire supporter. Since then there has been stubbornness, recriminations, and a second petition delivered to the club’s offices after the first was dismissed on technicalities. At the time, Davidson disingenuously fired broadsides at Hoggard and Boon for involving themselves in board matters when, he said, it was up to the membership if changes were to be made – this while all the while seeming to do his level best to avoid a frank and open discussion at which members would be privy to both sides of a conflict that has been raging since chief executive David Smith resigned in June. Davidson, in his statement yesterday, cited as the reason for his resignation the fact that he had asked Hoggard to remove his signature from the letters and retract his criticisms, and having given him 14 days to do so, stated that the captain’s refusal to grovel had left the chairman in a position that was “untenable”. He continued, “I find his actions difficult to understand and I hope Matthew realises his irresponsible behaviour has led to the chaos which has engulfed the club ever since. One of the resolutions set out in the petition – which I and many other members signed during that eventful week back in August – was the proposal for a vote of no confidence in the board. This is the same board which backed Davidson and which then moved very quickly yesterday to distance itself from him and to give Matthew Hoggard its full backing and support. Considering the board has been locked in legal discussions regarding changing the resolutions laid out in the petition, and given the events of yesterday, the question of whether this meeting will now even go ahead remains to be seen. Stay tuned. The club is not in the rosiest of health financially. Membership and attendance are issues that need looking at. But one cannot help wishing this whole imbroglio had been handled very differently, and if a finger is to be pointed, it must be pointed at Davidson for dragging the club into a crisis it must now dust itself down from. Anyone who has been following this saga knows that the club also has an extraordinary wealth of young talent who could go on to be future representatives of their country. The continued development of this talent is what the club must focus on now.